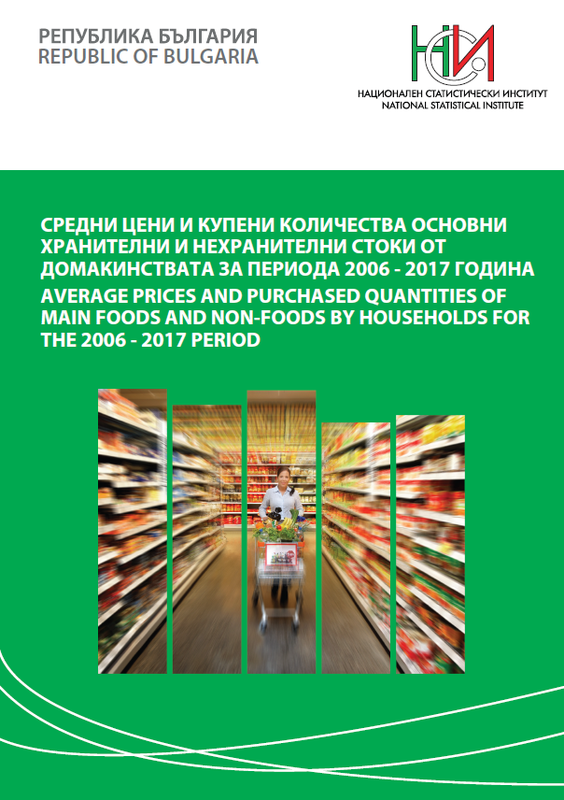 The National Statistical Institute presents to users of statistical information the electronic bilingual (Bulgarian/English) publication Average Prices and Purchased Quantities of Main Foods and Non-Foods by Households for the 2006 - 2017 Period. The publication contains data on the average prices and purchased quantities of foods and non-foods by households by years for the 2006 - 2017 period and by quarters of 2017. The information from the monthly survey of household budgets is used and because of that, these average prices differ from average consumer prices published monthly by the NSI. The purchased quantities of foods are computed average per household and the purchased non-foods - average per 100 households. There are also data on the purchasing power of households calculated by means of total and monetary income, as well as the changes in the purchasing power. The information in the publication is of interest to a wide number of users - the state authorities, public organizations, students and others. The issue is available free of charge on the NSI website and on CD-ROM.